Valentine’s day has come and gone, and I learned one major lesson this year. Buying scratch-n-sniff valentines may seem like a good idea, a very retro and hip idea, but scratch-n-sniff stink bug valentines are NOT a good idea. Never a good idea, really. And if my children’s teachers are reading this, or if any of the moms of the boys in their classes are – I am so very, very sorry. Though I was treated to Chinese take-out on Valentine’s night, Sam and I had our real Valentine’s celebration later in the week. Thursday morning, we typed out childcare and kitty-care instructions for Grammy and taped the note to the refrigerator door. After shoving our swimsuits and flip-flops and bottles of SPF-50 into a suitcase, we dusted off our neglected passports, kissed the kids goodbye, gave the cats scritches under their necks, and headed off to the airport to catch our plane to Mexico. We spent a full two and a half days lounging at the infinity pool, looking outward toward the swaying fronds of the coconut palm trees lining the beach and the blue waters of the Gulf of Mexico just beyond. We read a lot, finishing two books a piece, and we occasionally braved the frigid temperatures of the pool. I gorged myself on guacamole and salsa. I learned that Mexico’s version of “mild heat” in a pepper is not quite the version I’m used to. I completely relaxed. It felt good to finally catch my breath. I’ll share some photos soon, once I download them off my camera’s memory card, maybe this weekend. First, I must share this macaroni and cheese recipe with you. I was inspired to make this after flipping through the pages of an old, spiral-bound community cookbook, it’s yellowing pages chock full of recipes for mysterious dishes like “Sara’s Jello Surprise” and “Aunt Jean’s Spam Casserole.” I found a few recipes for macaroni and cheese casseroles made with a no béchamel technique — just the combining and baking of grated cheese, eggs, and milk, with already-cooked noodles. After fiddling around with the method and ingredients, this is the recipe I came up with. I made this last Sunday, before we headed out of town, in hopes that my kids would think I was the best mom EVER for leaving them with such cheesy goodness to eat while we were away. But it didn’t work out that way. It never does, really. My son was quick to declare that he did NOT like macaroni and cheese, and he refused to eat it. Refused to even sample a bite. I swear, I think someone replaced that child with a blonde, blue-eyed impostor. 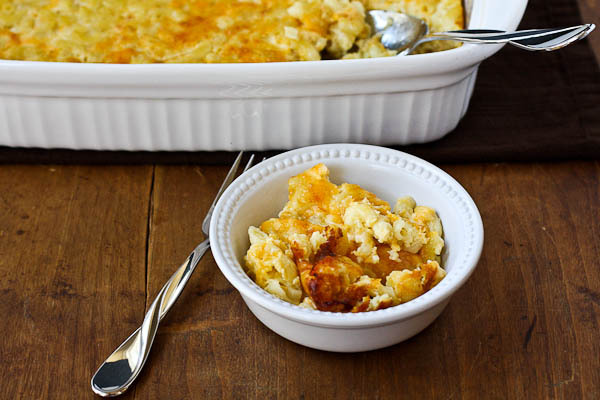 Macaroni and cheese casserole should always be present at pot-luck dinners and church suppers - or at any social gathering involving Southerners and food. 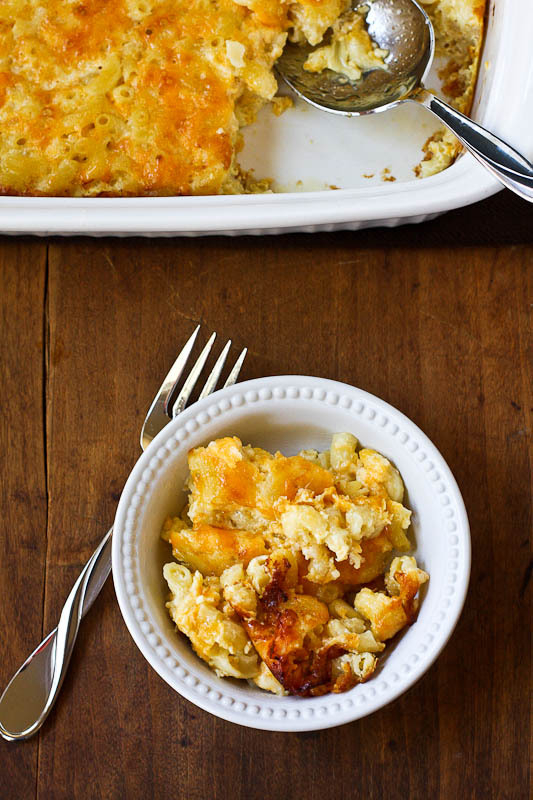 This version of macaroni and cheese is the dish you'll want to show up with. Preheat oven to 350 degrees. Lightly butter a 9 x 13 casserole dish and set aside. In a large pot of salted water, cook elbow macaroni according to package directions, until al dente, about 7 minutes. While the pasta is cooking, whisk together in a medium bowl the melted and cooled butter, milk, eggs, sour cream, salt, and white pepper. In a large bowl, combine the cooked and drained pasta, the butter and milk mixture, and the shredded cheeses. Stir well. Pour into the casserole dish. Bake for 45 minutes, until golden brown and bubbling. Are you kidding me! I wouldn’t dream of giving away something that good. There’s nothing better than the smell and taste of browned butter is there? You are so right, Sylvie. These would be way too hard to part with. 2 sticks of butter. Decadent! Nutty browned butter. Outrageous! I look forward to trying these, but agree with Sylvie, not sure I could give these away, even if I should. Thanks Brian, and MJ too! Not for one second did I think these weren’t sophisticated enough. I know just how much flavour brown butter adds to a dish and transforms it from oridinary to addictive. A great post and I’m glad I had a chance to head over here and browse through the rest of the blog. All love, by the way! Aw, thanks so much, Mike! Brian: I love Joanne Chang’s book, my copy is full of colored flags and every recipe I’ve tried has been successful. I will definitely try these. I’m so happy to have discovered your blog via Brian’s. I recently came across a Rice Krispie Treat recipe that involved rosemary and lavender. (Drool.) I think the addition of those to these browned butter ones would send this dessert out into orbit. Oh goodness, that sounds so delicious! Molly – that sounds like an intriguing combination (rosemary and lavender)! And, welcome! Thanks for sharing, Brian! I’m so glad you guest-posted so I could find your site! These look like an all-grown-up version of the favorite sweet! I have to try this! Isn’t MJ amazing juggling all that? So inspiring! Christina (Dessert for Two) – you will love Brian’s site! I love butter! Especially, brown butter! It’s so great reading guest posts and getting a glimpse inside to how wonderful relationships are formed in the blog world. I admire both of you, for obvious reasons-like well versed-blog post, stunning photography and super incredibly creative recipes. Funny, I’ve never been a fan of rice crispy treats. I’m more of a rich creamy, chocolaty type… though the brown butter had me at Hello! Sending you the sweetest wishes MG for Fritz – boo! Thank you for another delightful post Brian! I think anything with brown butter would be darn hard to pass up. Thank you so much for your good wishes. It stinks to lose a pet, but we’re getting over it, slowly. Love how this kid recipe can be turned into an adult version by transforming the butter! Thanks for sharing Brian! 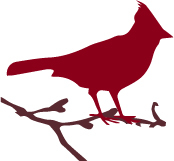 I just discovered your blog MJ and I will definitely be back. Hope you get some rest in these 18 days! Thank you so much, Nelly. Nice to have you here! That addition of vanilla bean is genius! Right? Love the entire recipe. Brian, those look insanely delicious. So sorry to hear about your kitty and tough work schedule right now. Sounds as if you are a master at delegating by choosing a guest post at the perfect time. Brown butter makes such a fun, childhood treat all grown-up. Love the post, recipe and photos. Hope things settle for you soon! Brian thanks for this fun post! I think this not only kid-friendly but adult friendly 😉 Thanks for introducing me to MJ. She sounds like a my type of person to follow. I already have a hard time resisting Rice Krispies’ treats. Now with brown butter? I’m a goner! Hello MJ, I’ve just dashed over from Brian’s place…so nice to learn more about you! I applaud your decision to take a break. Try as we may to have it all, if balance is not in place, the smooth ride we covet will become bumpy. You have my condolence for the loss of your family’s beloved pet. Please remember: In taking care of you, you retain the privilege to take care of others. Normally if it says Brown(ed) Butter I’m totally in but maybe it’s the kid in me…I didn’t even need that! I love, love, love Rice Krispies treats and I realized earlier today that a lot of the things I love are no longer being made because my youngest child has now moved on and there is no need. But…think I was wrong and just love this updated ‘adult’ version. I used to make these for my childrens school lunches. My recipe includes peanut butter but I’ve never made them with brown butter. Sounds delicious. Fabulous! I must make these soon! I’m completely touched by this post. I love food blog buddies and how we all have each other’s back when we need them. Hugs to BOTH of you!! 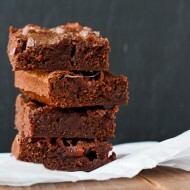 And for the treats…I think I need browned butter in my life. I want to eat these in bed tonight. Yes, the rice krispie squares are both kid and adult friendly, but when I think of rice krispies, I think of comfort and sharing amongst friends and I can’t think of two more caring people than both you and Brian. I’m sorry to hear about Fritz. 17 years in that house, he must have given and received a lot of love. Two sticks of butter in one batch of rice krispies treats? You just gave me chills, mister. CHILLS. In a good way. So funny, I hadn’t had a rice krispie treat until a few weeks ago when I made a cake batter version. This sounds great with the browned butter and addition of vanilla. I’m seeint these will be appearing again in my near future! I’ve been hearing about this cookbook- WANT, and this recipe has gotten some buzz too. Must make these as soon as possible! What a great way to “grow-up” a childhood favorite! Sounds wonderful! MJ, hang in there as you get through this crazy time. I, too, admire how you are able to juggle all you do. Hugs to you – my heart goes out to you with the loss of Fritz. He was such a good looking buddy. Thank you so much, Liren. It’s been tough, but we’re getting used to the idea that he’s gone. 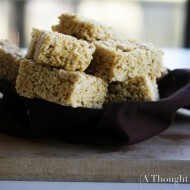 Brian – What an amazing twist on rice krispie treats… Can’t wait to try these! MJ – Hope everything’s going well for you… Hang in there! Thanks, Jen. I’m doing better. Thank you so much, Lora. I love Brian! He is one of the most generous, talented and nicest bloggers I can think of. And most talented too. Great post! Has anyone tried this with regular butter instead of unsalted? Would it just be too salty or something using regular butter and omitting the Kosher salt? I would think it would be fine. Erich – I’ve not tried that. I tend to cook and bake with unsalted butter – which allows me more control over the salt content of the final dish. There’s a lot of butter in this, so my guess is that it might be too salty if you used salted butter. Give it a try and report back! I have made these 3 times now and we loved them. I just posted them! These are to die for! I took them to tennis one day and even with the small turnout that day, they were gone in a flash. Awesome recipe! Thanks for that feedback, Rosie! I’m so glad to hear they were a success. What a great idea – I love the layers of flavor this recipe produces. 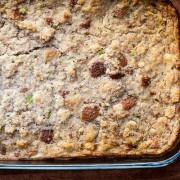 You can’t go wrong with browned butter! Pingback: White Chocolate Cranberry Pecan Rice Krispy Treats.